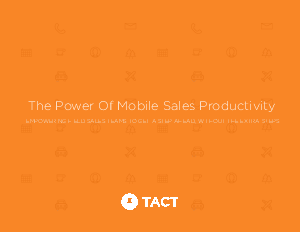 Is your sales team struggling with mobility and productivity? Do they spend too much time logging sales activities to Salesforce, hunting for customer information and documents, or copy-pasting data between separate systems? Have they resisted using mobile CRM solutions like Salesforce1? In this whitepaper, “The Power of Mobile Sales Productivity”, you’ll learn 1) common challenges facing field sales teams, 2) a framework for thinking about mobile sales productivity, 3) essential characteristics for evaluating mobile sales solutions, and 4) key trends in mobile sales. Sales reps waste up to 16 hours per week on non-selling tasks. That time adds up to serious costs across an entire sales team. Over 90% of all functions will be mobile-first for business-to-business sales operations and sales personnel by the end of 2016. Nearly 60% of high-performing sales teams already use or are planning to use a mobile sales app. And use of mobile apps for salespeople will grow 125% during 2015-2017. 55% of salespeople will access sales applications exclusively through smartphones or tablets by the end of 2016. Mobile sales productivity apps are not replacements for CRM systems like Salesforce. Rather, they integrate with them to access information centrally.